Other posts on this topic: Strawberry Week Day One: Strawberry Hand Pies. Okay, this recipe was the main event of my strawberry mania this year. 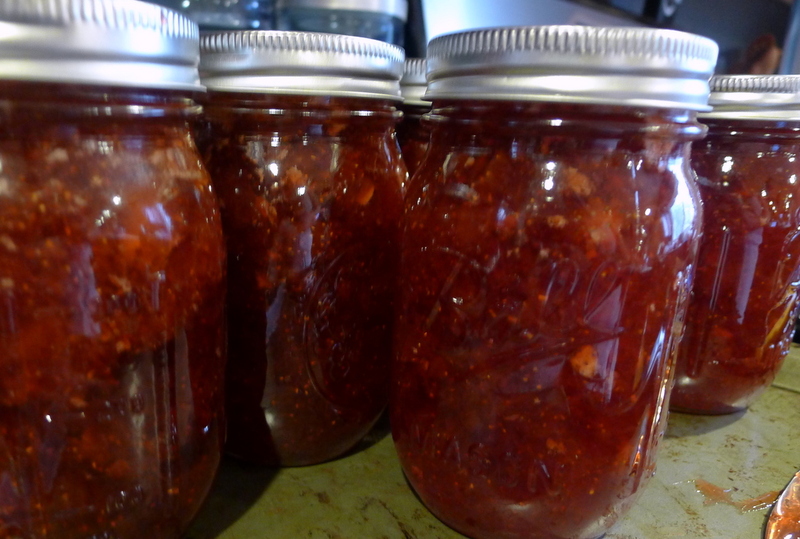 I used The Pioneer Woman’s recipe to make 6 big jars of seriously amazing jam. And it was actually pretty easy and straightforward. I do love canning more and more these days. I had 12 ounce mason jars instead of 8 ounces, but for some reason I ended up with only 6 jars of jam from the same recipe. I think that’s plenty, though. Fill the canning pot two-thirds full of water and bring it to a simmer. Using canning tongs, submerge the mason jars in the water. Leave them there with the water simmering while you prepare the jam. 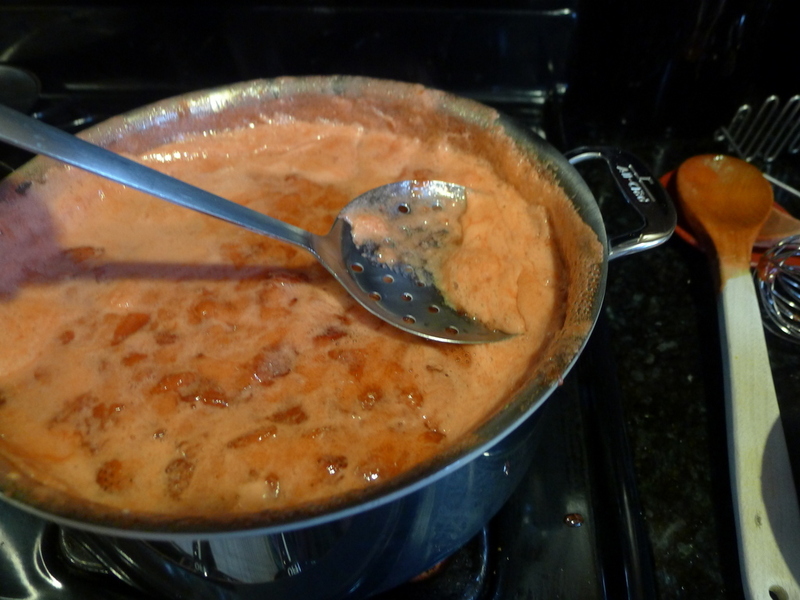 Bring a small saucepan of water to simmer and add the jar lids (but not screw on the rings). Allow them to stay in the saucepan while you prepare the jam. **I run a light dishwasher load of jars and leave them in the hot dishwasher until they’re ready to use. 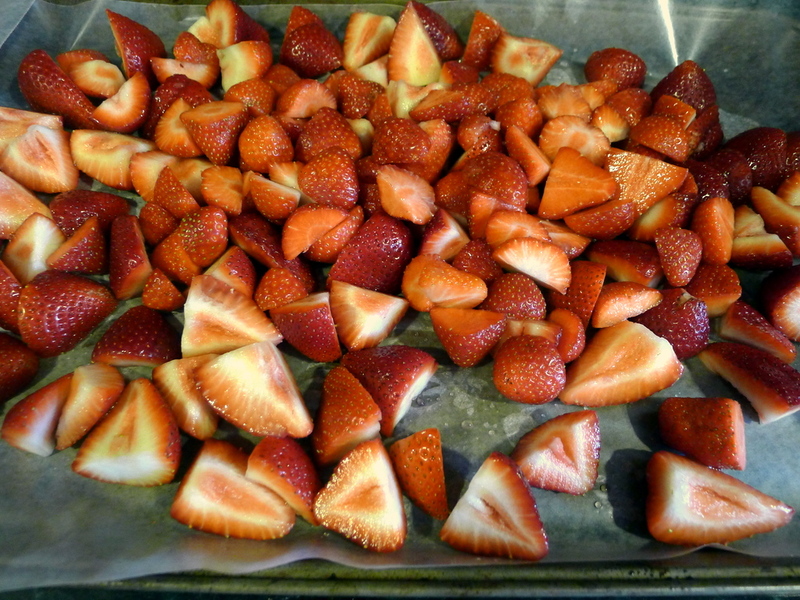 Place the strawberries on a large baking sheet and mash them until they’re mostly mashed, but still have some large chunks in them. Measure out 7 1/2 cups of the mashed strawberries and throw them in a pot. Add the lemon juice and give it a stir. Bring the strawberries to a boil over a high heat. 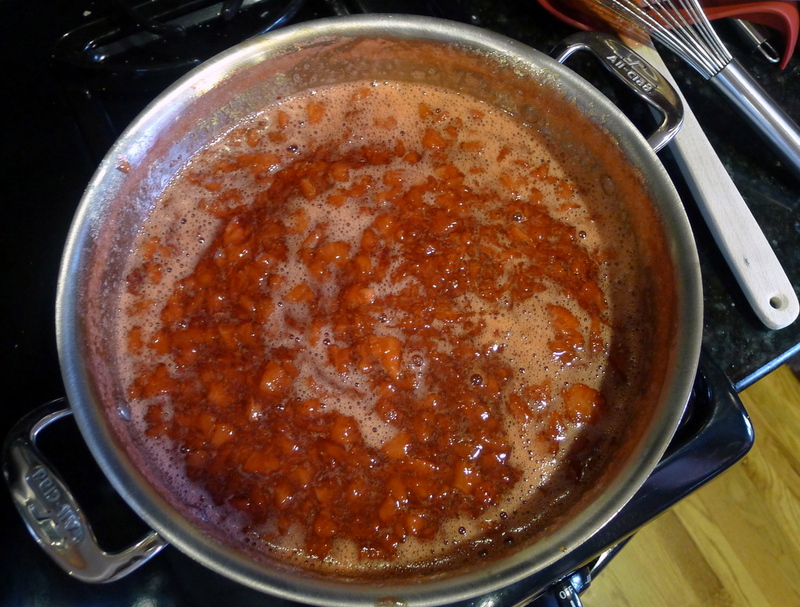 Then pour in the powdered pectin and stir to combine. After that, pour in the sugar all at once. Stir it around and bring it to a hard boil, which means you can’t get the mixture to stop boiling when you try to stir it down. 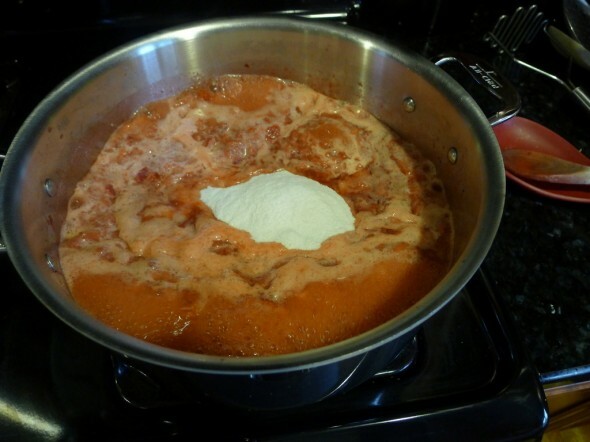 Allow to remain at a hard boil for 1 minute and 25 seconds. 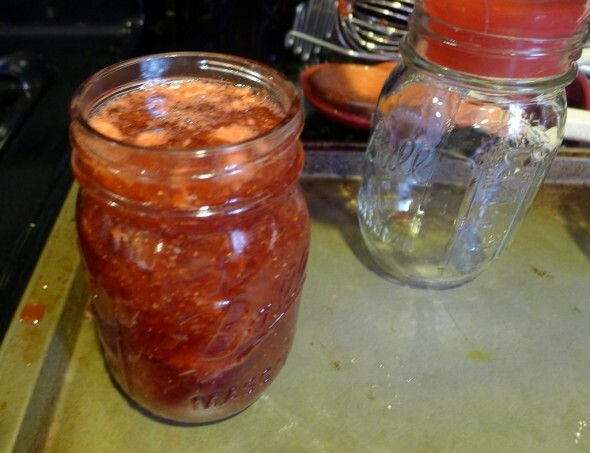 Use a damp cloth to wipe off any stickiness from the jars. Then run a clean knife along the inside of the jars to remove any air pockets. 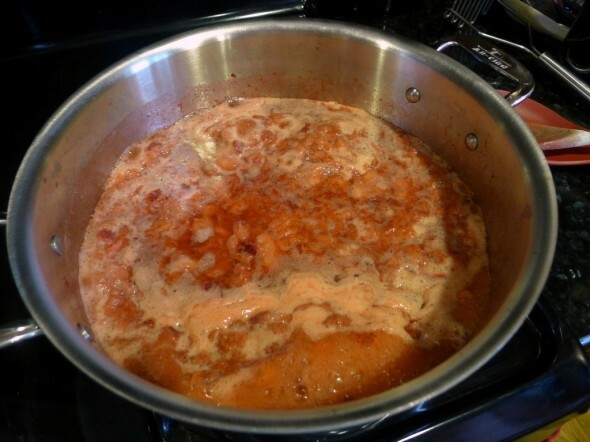 Remove one of the lids from the simmering water and set it on top of a jar. Center it, and then screw the round ring on the outside of the jar. Don’t over-tighten; just attach them gently. Continue until they’re all filled. Next, turn up the heat on the pot of water to high. When the water is boiling, set all the jars into the canning rack and lower the rack to submerge the jars in the water. Cover the pot and allow it to boil for 15 minutes. 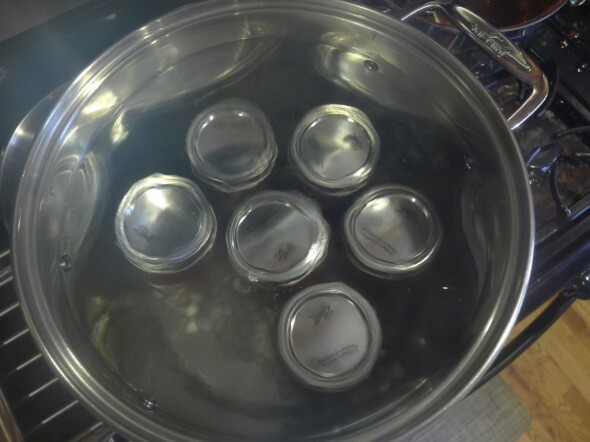 Turn off the heat and leave the jars in the water for 15 minutes more. Lift the rack from the water and remove the jars. Allow them to sit on the counter undisturbed for 24 hours; over a period of time, you should hear the lids pop as they seal themselves. It’s a very satisfying sound! After 24 hours, check the seals of all the jars: remove the rings from the jars and press your finger in the center of each jar. The center of each jar should be tightly indented and not give at all when you press your finger on them. Store the jam in the pantry… or give it to your friends! Refrigerate the jam once the jars are opened. I am making jam and pesto today (not together). i am using the freezer method on the back of the Certo package which is not as complicated and makes delicious jam, too. You just have to remember to defrost before you want it.